You’ll see the stand on your way into the hangar from the parking lot, so come on in, drop your gear, and come back when you have a few minutes to take a look. Get out to the loading area early for your next few jumps to soak in some of this great info, and it’s a good place to hang out on a weather hold as well. Whether you’ve been jumping for 20 days or 20 years, chances are good that you will find something on this stand that you didn’t know. 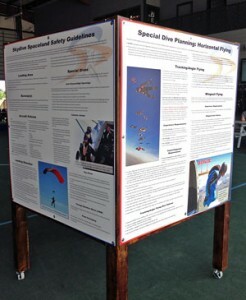 If you’re a new skydiver, you won’t have been in all of the situations where you needed all of this information yet. If you’ve been around awhile, keep in mind that skydiving is evolving very quickly and so must our safety policies (particularly when it comes to dives with a lot of planned horizontal movement, such as tracking, tracing, and wingsuit dives). Even after 17 years of skydiving, I learned a lot while putting this together, so hit the loading area a few minutes early to check it out! Some of the information on this stand is old, and some is new. Some of it describes policies we’ve been following, but which may not have been spelled out where visiting and newer jumpers could discover them easily, and some policies are new. If you have any questions about why any of these policies are what they are, just ask one of our instructors or manager and we’ll be happy to explain the reasoning. We will also be sharing some of the specifics on this stand in future issues of FlyTips. Thanks to Skydive Arizona for the inspiration!